And that is all from us here this afternoon. Why not join Mike Henson for the rest of Preston 1-1 Arsenal here? Sutton United boss Paul Doswell told BBC Radio London. “We created good chances and restricted them to very little overall. People are telling me that we were the better side, but that doesn’t count for a lot as we haven’t gone through yet. But we have to feel very proud or ourselves. “Nine times out of 10, especially at their place, Wimbledon are the better side and they are going to beat us. “But we matched them today, that is the magic of the FA Cup. We have to produce an upset now. We went from having decent enough chance, 50-50 maybe, now down to shorter percentage. “But still it is a chance and in life you can take your chances. “I’m trying to be realistic. We will need a bit of luck on the night." “At the end, I was emotional. When you've been at a club for so long and you see that amazing support, it was a bit emotional. There's nothing wrong with that, I don't think. “I didn't expect it (to be asked to address the supporters at full-time) and sometimes you don't know what you're saying in circumstances like that, but I wanted to say a big thank you from everybody connected with the football club for the support we've had today. Eastleigh manager Martin Allen told Radio Solent: "There was a worry at half-time that the players would back off, show fear and they certainly didn’t do that. “I thought we took the game to Brentford in the second half, kept a clean sheet in the second half and I wanted the players in the second half to go out and do their families proud, and they certainly did that." Derby midfielder Tom Ince, speaking to BBC Radio Derby about his match-winning free-kick: "It's about time I got one in. I practise free-kicks a lot in training, and it's nice to do it on a match day. "The free-kick was in an awkward position where I couldn't really put it into the box for a cross. The goalkeeper had three in the wall, and he left a lot of space to his left, so I thought that if I was able to get it up and over the wall and on target, then I'd give myself a chance. As soon as it went over the wall, the keeper didn't move - and I think he knew straight away that was in. "It was a fantastic performance all round. It's always a big test when you come to a Premier League side, especially when you're away from home - but I thought we played ever so well." Lincoln boss Danny Cowley: "My players were heroic for me today, absolutely heroic. "There was a tinge of disappointment at the end, but the overriding emotion in the dressing room is one of pride. "We went toe-to-toe with a good, experienced Championship side and gave a very good account of ourselves. We spoke all week that a success for us would have been getting a standing ovation at the end. "We wanted to give our supporters something to remember and for a National League club to have 5,000 supporters away from home says everything about them. If we can be half as good as our supporters, we will be a very good team." You can catch up with the latest from Deepdale here. Watford Head Coach Walter Mazzarri: "I was very happy with the new faces. (Brandon) Mason made his full debut and managed to do very well. It is something important for the long-term future of the club. "It is a good win for a team not doing very well with results. This today will help with confidence for Premier League. "It is very important to win, especially for our fans. We wanted to give them this satisfaction and hopefully we can do the same next week against Middlesbrough." West Brom manager Tony Pulis, speaking to BBC WM: "I'm really proud of the players. They've worked so hard. We battered them. We needed a break and we didn't get a break. "The two goals they scored are disappointing from our point of view. We should have dealt with the first one - we stepped away from their player. "With the second one, we'll have to talk about the wall. I've been in to see Jon [Moss, the referee], and he's marked out 13 paces for that free-kick. With others in the game, he's marked out 10 paces. Those are the breaks you need to get through in cup football." Unconfirmed at this stage but there are reports that defender Nathan Ake is going to return to Chelsea from his loan spell at Bournemouth - where has has impressed. Paul Cox not a fan of 'going digital' there. Barrow manager Paul Cox: "We were on the verge of making history in this competition but it's over, it's chip paper, and I've told the players it is now all about how we react from today's defeat in terms of our mind-set and approach. "There has to be a sense of pride that we've got as far as we have and while I'd love for us to have been more clinical in front of goal, realistically I don't think we were good enough to win the game today." Swansea manager Paul Clement: "I wouldn’t say we need an influx because there are good players in this squad already. "But we are looking to do something, and we have got to make sure the players we bring in are better than what we have got. Steven Naismith's injury-time header secures a replay for Championship side Norwich City against Southampton in the FA Cup third round. 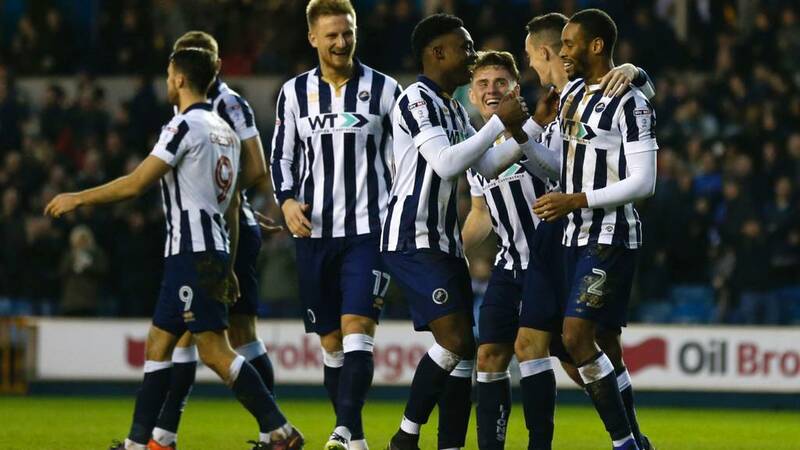 League One Millwall produce an FA Cup third-round shock as they claim a deserved 3-0 victory over Premier League side Bournemouth. Crystal Palace manager Sam Allardyce: "We're still in the hat. Bolton gave us a real good game. I want us to get better - I wouldn't say I was satisfied with what I saw. "We haven't kept a clean sheet for a while at this club, so we've got that. And we'll take Bolton back to our place later this month. "For me we should have had enough to beat Bolton, if I'm honest. If we were clinical we would have." Stoke manager Mark Hughes: "We lost the game on the first half, the strength of the XI we put out should have been capable of getting a result this afternoon. "We wanted a cup run, sadly that's not the case and that's disappointing. We need to pick up and get our act together next week now." Non-league Eastleigh's FA Cup run is emphatically ended in the third round by Championship side Brentford. Sutton boss Paul Doswell on 5 live Sport: "I felt we deserved to win what was tight game. We have four or five really good chances and restricted Wimbledon to very few. We even hit the bar. "I think today was an opportunity missed, but I do believe that there will be an FA Cup upset and we still feel it can be us, going to Wimbledon, who cause it. We will not be overawed in the replay, I can promise that. "I am so proud of our football club, putting on an event like this today for 5,500 people. We were in no way disgraced today. "I hope to see many, many people at the replay and perhaps we might just be chosen by the BBC to be the televised game."